The Mathews Halon is the all-new flagship bow released in the 2016 bow lineup. While the rut in most of the country is winding down, the bow shopping season is heating up and there’s no better brand to check out right now than Mathews Inc. Today, Mathews released their 2016 archery lineup and they’ve got some big, big news. The 2016 Mathews bow lineup includes an all new flagship bow that is Mathew’s hardest hitting bow yet, the Mathews Halon. There is also an addition to the NO CAM lineup with the 2016 Mathews NO CAM HTX. The Mathews Halon is part of the 2016 lineup of their all-new bows. The 2016 Mathews bow lineup introduces the all-new Mathews Halon. 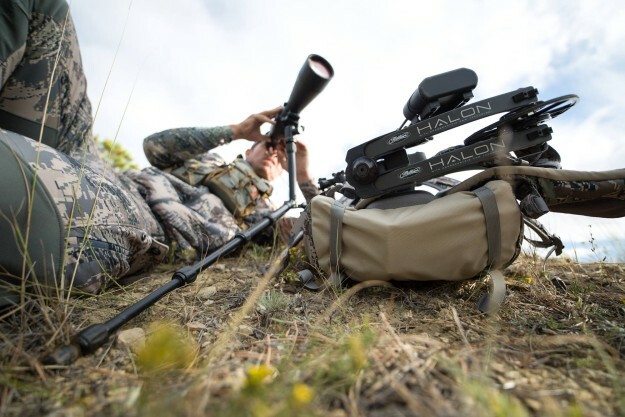 The Mathews Halon brings on a new Crosscentric cam, that was inspired by the No Cam and employs a partially concentric string payout and AVS Technology. This means that the bow is faster and more accurate and delivers an arrow that goes straighter at longer distances. With the Halon, shooters will have more consistent groups at longer distances and will love the stealthy draw in this incredibly quiet and rock solid bow. Available in 75% and 85% let off and coming in a variety of colors including Lost Camo XD, Lost Camo OT, Black, Black Tactical and Stone, the Halon is equipped to fit your needs and attitude. The bow is 30 inches from axle to axle and can reach speeds of up to 353 feet per second. It weighs in at 4.6 pounds and can be had in a five, six and seven inch brace height. Check out the new Mathews Halon Video below and read on for the No Cam HTX information. Mathews HALON™ | Accurate. Energy. from Mathews Inc on Vimeo. Mathew’s new 2016 bow lineup includes an addition to the No Cam lineup with the new HTX. Last year’s huge introduction of the NO CAM HTR was big news in the archery industry. The Mathews No Cam HTR was a revolutionary bow that garnered rave reviews from shooters of all ages and skill levels. The new Mathews NO CAM HTX builds upon the HTR’s stellar reputation by providing an even smoother draw, better accuracy and many new features. The NO CAM HTX includes Mathews’ new bridged riser design, rigid quad limbs, twin Harmonic Stabilizers, and is fitted with the all-new FlatBack™ grip. The HTX comes standard in Lost Camo® XD, and is also available in Lost Camo® OT, Black Tactical, Black Anthem and Stone. Be on the lookout for our reviews of the amazing 2016 Mathews Archery lineup. We’ll fill you in on our thoughts on the 2016 Mathews No Cam HTX and the Mathews Halon. Be sure to read our reviews of the Mathews NO CAM HTR and the Mathews Creed XS review.